Our spicy Merguez, unified with the freshness of apples! This recipe by Sabine is taken from the Wheaty-Cooking-Challenge. Cook the rice in ¼ litre of salted water for 15-20 minutes. Cut the leek into small cubes, peel the carrots and kohlrabi and also cut both into small cubes. Steam the vegetables until they’re firm to the bite in some olive oil. Fold in the rice and season with salt, pepper and a pinch of curcuma. Keep warm. Wash the apples, halve them and deseed. Then slice them into 12 evenly sized columns. Carefully cut the Merguez into 12 evenly sized pieces and alternately thread the Merguez and the apple onto the skewers. Lightly oil the skewers and fry them on both sides for 4-5 minutes (alternative: use a grill). 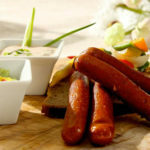 Arrange the vegetable rice in rings on the plates and serve together with the skewers and the yoghurt-lemon-dill sauce. Mix the soya yoghurt together with the grated lemon peel and some lemon juice. Wash and dry the dill. Chop it up and mix into the yoghurt. Season with salt and pepper.